Last night a librarian gave me some begonias and some red verbena that she had used for a teen program and a bag of potting soil. So, today I repotted my kalenchoe. I put the verbena in a pot and sat them on the table in the front yard. I put some of the begonia's in the swan and some in the pig and some in a flowered pot. I tried to take pictures but the time of day was wrong and I either got too much sun or too much shade. Dan would have adjusted his camera to fix it but I'm just a point and shoot photographer. What I get is what I get. 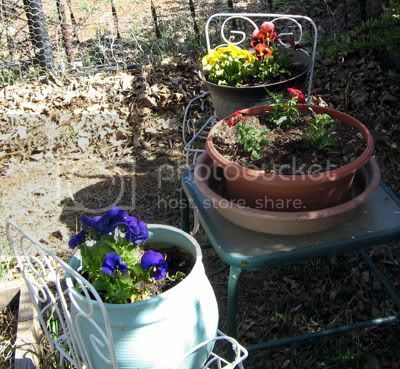 I tried to get the purple iris and another little purple plant but didn't get those either. I'll try those again in the morning. I see some different iris are going to bloom. They belonged to Dan and I dug them up when he moved and put them in one of my flower beds. This is the first they will bloom and I think they have too much shade because some aren't blooming at all. I will tell him if he wants them that he needs to come and dig them. I told him he could come and divide mine after they bloom, too. I watered all the plants this morning. The rose bushes have buds now but they also have aphids so tomorrow I will have to spray they with some soapy water. I sprayed my kalenchoe at the beginning of the week. It looked like the bugs had died so I sprayed them with warm water this morning and wiped off the leaves. I now have two pots of kalenchoe instead of two plants in one pot. They were getting so big they really needed their own pots. It's still too cool to move them outside for the summer. I pulled some weeds and grass this morning. I watered the apple trees. They are two years old so I may not need to pick off the flowers this year, that is if they get flowers. The flowers looked a little brownish and I sprayed them with some soapy water, too. They had little bitty flying bugs of some kind. They weren't there this morning so I'm hoping the buds will go ahead and flower. I haven't had an apple tree in my yard before now. I always went to one of those pick your own places. Arizona doesn't have any close to us though. You would have to go where it's not so hot. We fixed a place in the fence where Chance could get her head through. She was looking for cats. dr bought a humane trap last week so as soon as we find a place that will take them we can trap some of those feral cats. So many places charge you and we can't afford to take too many cats if we have to pay for each one. I can understand it because they have to have food but these cats are fending for themselves and digging in my flowers and need to be moved. I will try that no kill shelter but last time I called they were full. The swan. Hopefully those begonia's will grow and fill the space. Very nice flowers. Having read your entry, it's apparant that you have really been busy. I had no idea that feral cats were a problem there in Arizona. Thanks for the good reading and pics. 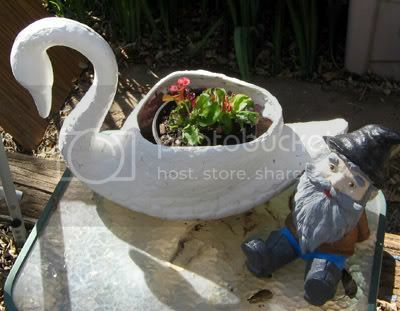 Your planters all look super Dooley especially the swan. Those begonias will soon fill the space I'm sure and look even better. Good luck in catching at least some of those feral cats. Oh Dooley you have inspired me! I can't wait to get all my planters done and all these plants outside! I have a question - you mentioned pulling the blooms off your new apple trees. I planted a cherry and 2 pear trees last year. Should I be pulling the blooms off them this year and why? I like your swan. I have just started red apple & green apple trees this year, not sure how they'll do but I thought it'd be fun to try. Very pretty colors. Well done with everything Dooley, and good luck on your cat mission. Another three weeks or so and I'll plant up the pots outside too. Sounds like you've been pretty busy! Isn't is nice to be able to get your hands in the dirt again?! I wish you success in getting the feral cats. We have at least 15 here where I live. I just dig around them. You have been so busy, girl . . . and your work has paid off . . . quite beautiful pics, I may add. (I love your swan!) The pansies are gorgeous also. Too bad about the feral cats . . . at least you are doing something positive about them. What a kindhearted person you are.